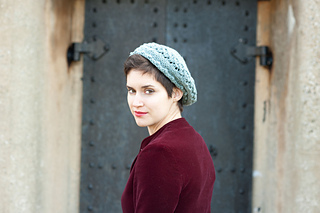 This beret design was born from Kristen’s desire to make a lace beret that didn’t require any increasing or decreasing to occur while working in a lace pattern and she wanted something with an easy-to-memorize pattern that could also keep in the warmth. 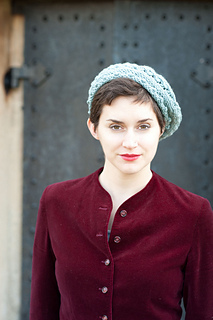 The crown is knit sideways with short rows worked in Garter Stitch at the center to add some thickness and extra warmth. 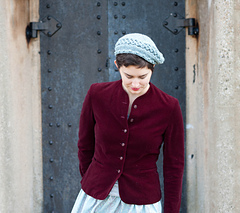 The lace panel is worked along the brim edge at the same time as working the short rows. 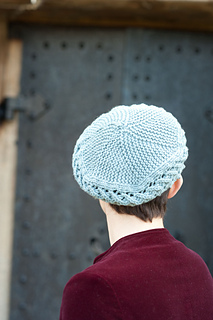 When six repeats are completed the crown is joined into a circle, then the brim stitches are picked up along one edge. Worn with negative ease; will fit up to 22” head circumference. 1 skein Quince & Co. Osprey (100% American wool; approx 170 yards per 100 g skein) in Bird’s Egg. Size US 9 (5.5 mm): straight and 16” circular.